I doubt this has seen the light of day for 13 years. While doing compilation and collection of media for GET LAMP I found a 1994 CD-ROM insert for a magazine that contained audio/graphical reviews of various contemporary computer games, as well as a preview for a number of other games, including the never-finished “Planetfall II: The Search for Floyd” (or Planetfall III, as it was sometimes called). Also contained on this CD was an interview with Steve Meretzky, in the middle of doing work with Boffo, Legend of Entertainment, and potentially working with Activision on the Planetfall project. He’s 37 years old, and in good spirits. The interview was actually 40 320×240 VFW 1.1 (Video for Windows) clips, which connected to a DOS program that would summon them in a window as you pressed different buttons. Separately was a data file with the questions they asked (or, more accurately, grafted onto the clips afterwards, because some only tangentially connect to what Steve is saying). 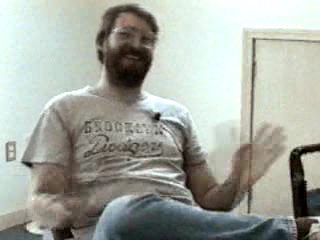 I’ve gone ahead and yanked these clips into my video editor, added the questions as title cards between them, and rendered it, giving you a 16-minute video interview with Steve Meretzky that likely, as I said, hasn’t been seen for over a decade. Grab the MPEG-2 video file here. (94mb, 0:16:26). The disc also contained a (again, only workable through the DOS program) preview of this version of Planetfall, including initial graphics and screenshots. I’ve gone ahead and edited that into something usable. So go ahead and grab that here. (21mb, 0:02:17). Or, if you prefer, this one was small enough to fit as a youtube video. As I understand it, creative differences between Meretzky and the producer over the direction and approach to the finished product was a major reason for the project ultimately being shut down; other reasons might have gone into it that are lost to time. Either way, the world lost out on what likely would have been a great little game. 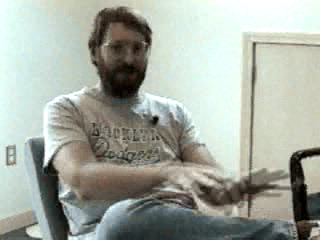 Steve Meretzky gives great interviews (I have a couple with him of my own). This is no exception. What else is in my collection that I haven’t found yet? 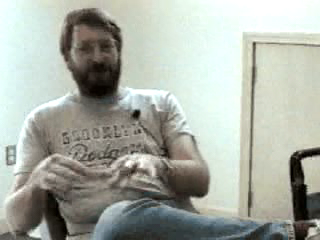 Update: I have been told that this interview was conducted by John Voorhees, who also authored the original software for the question and answer setup, and that these days he’s a folksinger at johnvoorhees.com.